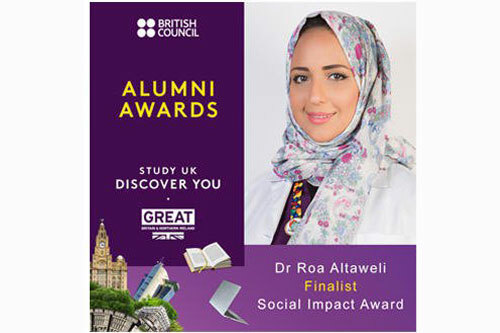 Dr Roa Altaweli, a recent PhD graduate from City, University of London, has been announced as one of the finalists of the 2017-18 Study UK National Alumni Awards. As the first Saudi midwife to obtain a PhD in Midwifery, Dr Altaweli was selected from more than 120 applicants and was nominated in the Social Impact category for her research and development of the first professional midwifery association in Saudi Arabia. The Saudi Midwifery Group is now formally established and working at a high level. Dr Altaweli is a founding board member and chairperson and Professor Christine McCourt from City is also involved as an international advisory board member. The Study UK Alumni Awards were established in 2014 and celebrate the achievements of those who graduated from UK-based higher education institutions and went on to make outstanding contributions in various fields. This year the award ceremonies will be held in Riyadh on Monday 26th February 2018. In particular, the award nomination relates to the work Dr Altaweli has done building on her doctoral work. Her findings indicated a range of changes were needed and she has made great progress with supporting their implementation, working at national policy and practice level. This includes the development of a full professional midwifery education programme and also training programmes to increase capacity in education and research to help address some of the issues identified in her study. City has been supporting this, and Dr Mandie Scamell from the School of Health Sciences has recently travelled to Saudi to contribute. Dr Altaweli is now also looking at the possibility of setting up midwife-led maternity units in the Kingdom in line with international evidence of best practice, and has also managed to open the first midwife clinic among the Ministry of Health hospitals in Saudi Arabia.